Mizuno Wave Sonic are neutral racing running shoes. 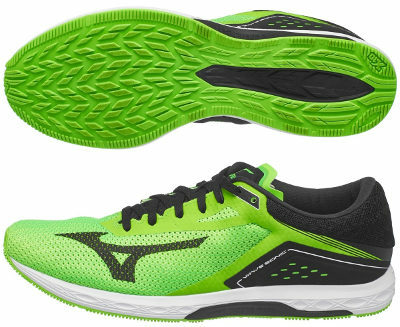 The brand new Mizuno Wave Sonic has been released under some controversy because theorically is placed between radical Wave Ekiden and versatile Wave Hitogami 4 but several rumors point Wave Sonic to replace Wave Hitogami within Mizuno's racing flats lineup in the same way Wave Shadow did with Wave Sayonara 4 in performance ones. Anyway, one of the most interesting features of the Wave Sonic is lowering drop down to 4 mm, something never seen before among (modern) Mizuno running shoes. Maybe weight is the closest attribute between new Wave Sonic and its theorical predecessor Wave Hitogami 4 because everything else changes. Upper is made of one piece with fused elements to provide secure and snug fit on dual layer mesh plenty of ventilation holes to improve breathability. Tongue is thin but properly padded and attached to both sides preventing undesired wrinkles and improving comfort, making it suitable to wear it sockless, something that can boost its popularity among triathletes. Another interesting innovation incorporated in Wave Sonic is the ESS Wave™ designed for fast midfoot running embedded within U4icX™ foam in midsole and not visible from outside but delivering expected stability and stiffness from Mizuno. Outsole is also different to usual configuration from japanese brand with more ground contact and lug pattern plenty of rhomboid shapes slightly distinct depending on the area to improve traction and grip. Regarding materials, Wave Sonic outsole relies on well known X10 rubber to increase durability.